Supporters of the proposal for a football stadium on the Hudson railyards describe it as a way to revive the neighborhood, the city, and the region. In reality, the plan serves only the needs of the New York Jets. Stadiums have not proved to be sensible public investments. On game days, they clog the streets with traffic -- in this case in an area where streets are already straining under the weight of the Javits Center, Madison Square Garden, and the theaters on Broadway. In other cities, when no events are scheduled at a stadium, by contrast, the surrounding area turns into a ghost town. This pattern discourages other types of developments nearby. This would be bad for the west side even if no public money was used. But stadiums always require huge public subsidies to build and often operate only with additional public money. Yes, the $800 million that the Jets propose to invest is unprecedented. But the city and the state have each pledged $350 million to deck over the railyards and build a retractable roof. And that doesn’t include the $700 million the city is going to invest in the stadium by creating open spaces, condemning property, and constructing parking garages nearby. Before the city pours over $1 billion into this project, we should consider that not one football stadium in the country works in such a dense urban area. Some claim that this stadium will be the exception. It been dressed up with the current flavor of sustainable architecture and presented as part of a larger plan for the area. But recent additions of a Museum of the Science of Sport and a community theater are just window dressing. The retail square footage is minimal—equivalent to a large Duane Reade or CVS. The proposed open spaces around the stadium are hard-surfaced plazas and walkways--not parks. All of these items are in the service of the main event—the75,000 seat stadium. Councilmember David Weprin recently said that the stadium would be good for the city’s finances. However, his financial analysis was not independent. He later clarified it was taken from a report commissioned by the Jets. Prior to the political arm-twisting by Governor George Pataki, Mayor Michael Bloomberg and the New York Jets, the officials of the Javits Center showed little interest in the stadium-equals-convention-center idea. Plans developed by the New York Convention Center Operating Corporation, the state entity that operates the Javits center, proposed an expansion to the north, completely covering two blocks and erasing two streets, with a high-rise hotel on 11th Avenue and 42nd Street. The stadium plan to the south was a footnote to their planning efforts. But when the leader of the effort to bring the Olympics to New York, Dan Doctoroff, became the city’s deputy mayor for economic development, this footnote became the plan’s main storyline. Doctoroff has pushed hard for a stadium in Manhattan as a vital part of the Olympic plan. But there is no reason that the Olympic stadium couldn’t be built in Queens instead. Now the Jets propose to enter a business they know nothing about and run it at a profit. But convention centers are generally run by public authorities, whose goal is only to cover expenses. 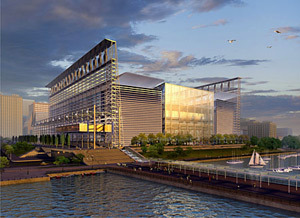 Convention centers are not intended to earn money for the operator, but to make money for the city or region where they are located. Their purpose is to draw visitors to a city to spend dollars on hotels, restaurants and other attractions. Many convention centers actually lose money. When the Jets realize that they cannot make money running conventions, they will probably begin to compete with Madison Square Garden for events like concerts or circuses. If they succeed in this, the west side stadium will not bring new business to New York, but merely pull existing events a few blocks westward. It is a good idea to make a large public investment on the west side, by decking over the rail yards, laying out streets, and building sewers and streetlights. Instead of the Jets stadium, the city should break the railyards into several sites. The Javits center could then expand both to the north, as currently proposed, and to the south into the railyards. Then we could also build a new park overlooking the Hudson and create infrastructure to encourage the private sector to redevelop six blocks of exceptionally located waterfront real estate. This would spread the risk out over a range of businesses in a variety of business sectors â€“ office, commercial, retail, residential, hotel. The city’s increased tax revenue would not depend on a single business, especially one using a plan that has proven itself a failure elsewhere. Joe Restuccia, the executive director of the Clinton Housing Development Company, is on the board of the Hell’s Kitchen/Hudson Alliance, an organization of community groups and elected officials opposing the west side stadium.